Every year I get questions about what is the best summer beer and which of these beers are going to appeal to my non-craft beer drinking mates and me? I've done my best to assemble nine of the best for you and will give you a quick run down. I'm limited the ABV at 4.7%, so I could get the Mountain Goat in, with the idea being you always want to have 1 more on a hot summers day. In true summer style these have all been enjoyed straight from the vessel, be it can or bottle. 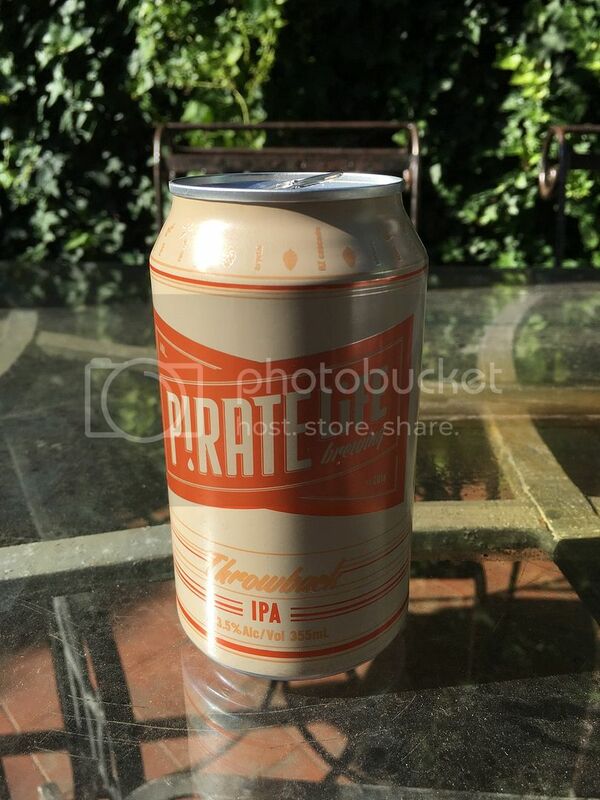 Pirate Life Throwback IPA - First up was South Australia's Pirate Life and their Throwback IPA. Clocking in at just 3.5% you could drink these all afternoon. 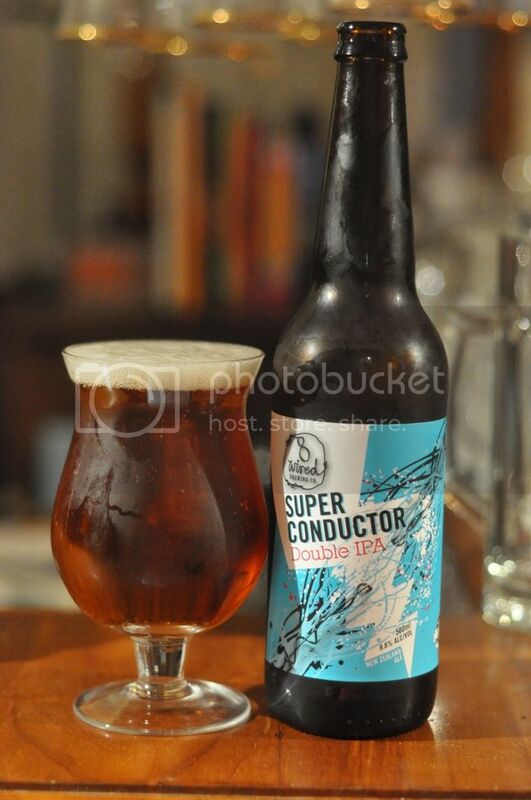 These Adelaide based guys make my favourite Pale Ale, which unfortunately was too high for the ABV limit I set. I've only tried this beer once before, in Austria of all places, so I'm looking forward to trying it again. I was quite impressed with this beer. There was good citrus hop characteristics and a reasonable malt base, considering the low ABV. It's actually quite a full bodied beer for the ABV and I'd find it incredibly easy to knock off a few of these on a nice afternoon. 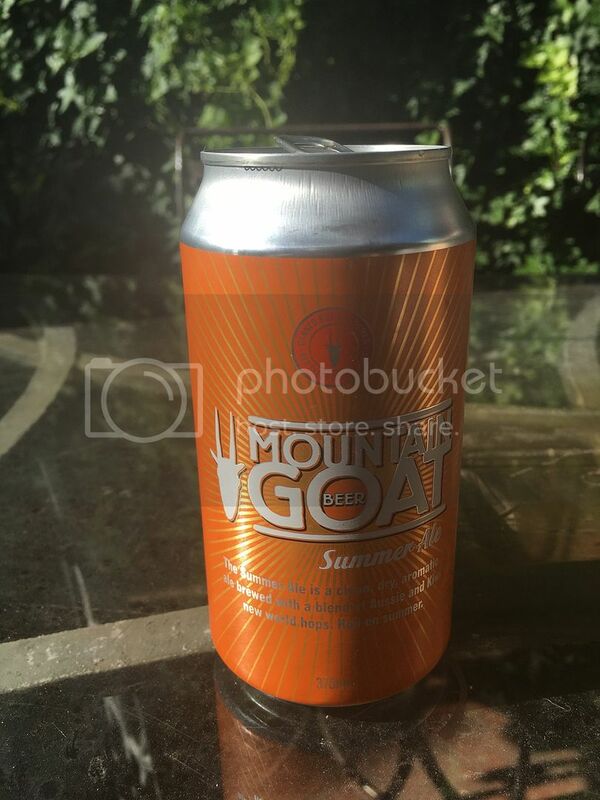 Mountain Goat Summer Ale - First released 2 years ago, the Mountain Goat Summer Ale has slowly but surely gained a foothold in the Melbourne drinking scene. It seems like it's stocked at every even slightly crafty venue you go to these days, Find my full review from back then here. The can design may have changed a bit, but the beer is still eminently drinkable. There's still plenty of tropical fruit flavours, with relatively low bitterness. It finishes very dry and just leaves you wanting more! This particular can had a slightly unusual aftertaste which I couldn't quite put my finger on; it was either wheaty or yeasty. It wasn't particular unpleasant though and certainly wouldn't stop me drinking more in the future. 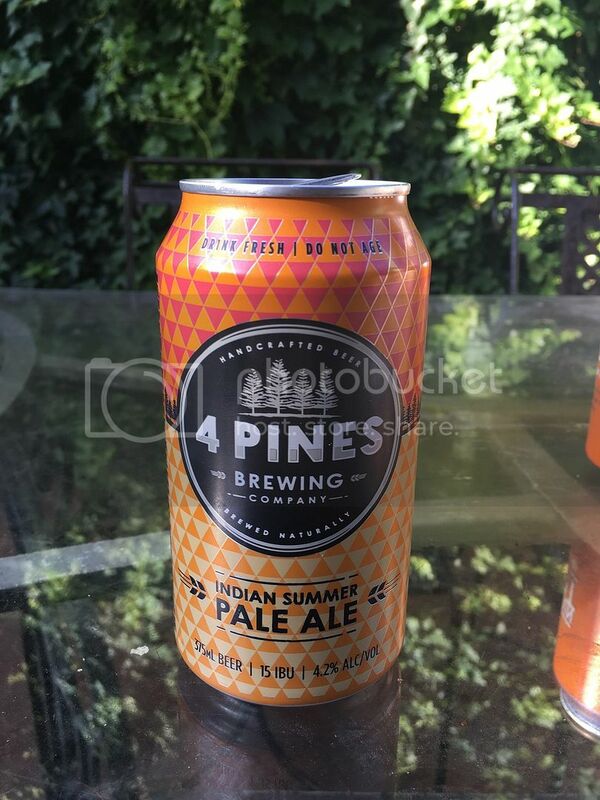 4 Pines Indian Summer Pale Ale - The latest release from 4 Pines is also their first foray into canned beer. The Indian Summer Pale Ale is (a mouthful to say!) I think trying to work off IPA and get the faux-craft market interested (think James Squire/Yenda drinkers). At only 15 IBU's it's certainly not anywhere near bitter enough to be mentioned as an IPA. It's definitely got less fruitiness than the two beers mentioned above. The hops were more reminiscent of a pilsner than a pale ale. There's melon and grass aromas and flavours. This one is definitely going to appeal more to lager drinkers. At only 4.2% I can see these going down quite nicely throughout the warmer months. 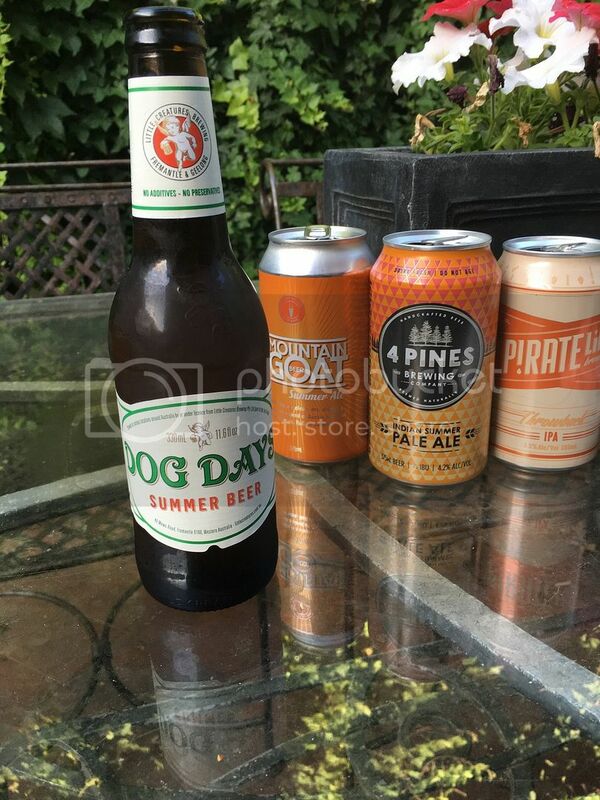 Little Creatures Dog Days - Another relatively new release, Little Creatures Dog Days Summer Beer is one I held high hopes for. These guys consistently brew quality, hop driven ales and are popular with both craft and macro drinkers alike. Dog Days was definitely the hoppiest of the bunch so far. It had great fruitiness, with peach particularly strong. 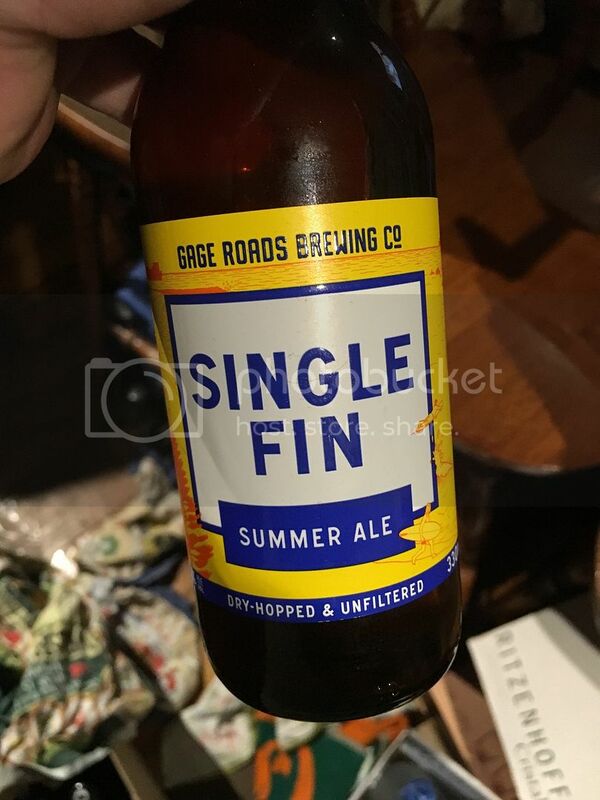 It's got a lingering bitterness, that is strong enough to excite the tongue, whilst not overpowering the delicate wheat body that this beer possesses. The mouthfeel is nice and light and makes it incredibly easy to down. 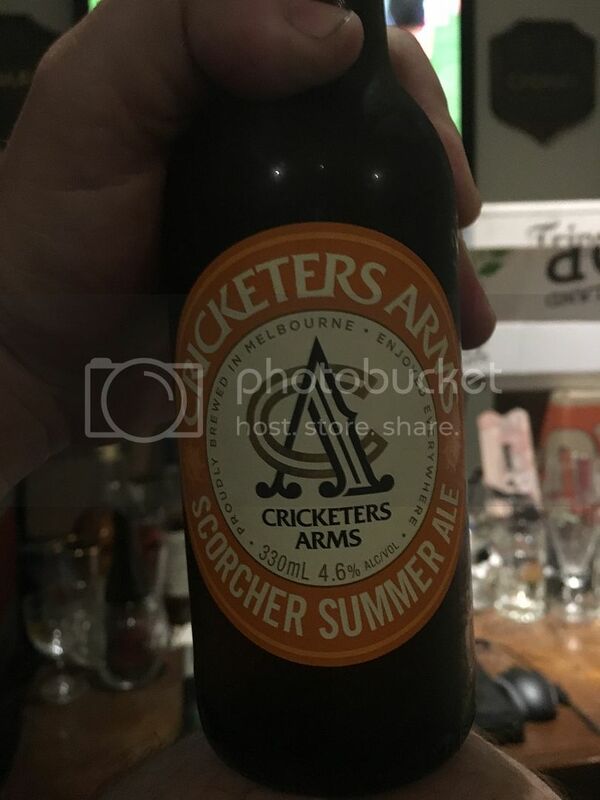 Cricketers Arms Scorcher Summer Ale - I actually wanted to get their Spearhead Pale Ale in this review, although at 5.2% it was above the allowed ABV. Walking through my local Dan's I stumbled across this and suddenly it was in this round up. I'm not sure if it suffered by being after the Little Creatures, but it seemed the sweetest of the lot. It was pretty light on both flavour and aroma, not that that's terribly surprising. What little there was wasn't overly offensive, with some nice fruitiness, mostly passionfruit, coming through from the hops. It could do the job on a hot afternoon, but it's not great. 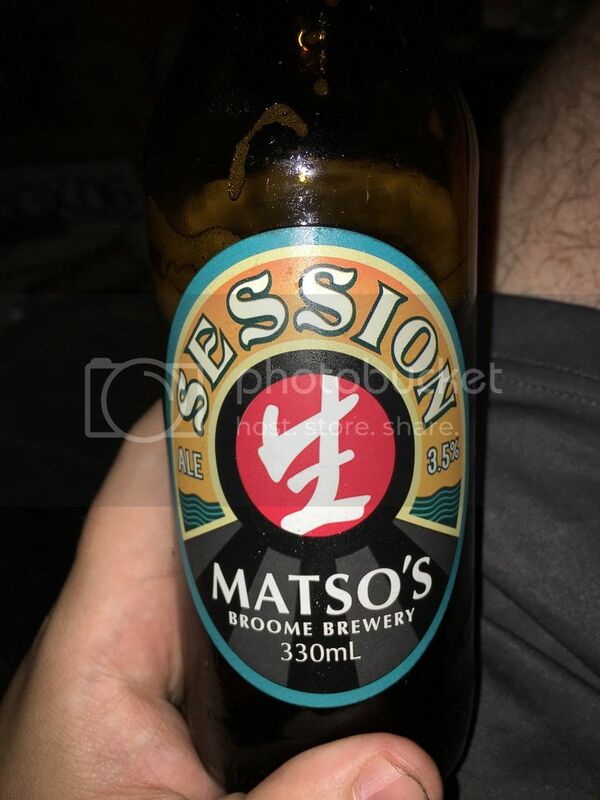 Matso's Session Ale - Broome is not exactly the first place I'd think of that would have a craft brewery. Matso's is that brewery however and this is a beer I'd never heard of from them before. At only 3.5% this is the lowest ABV of the gathered assortment, so you should be able to knock these off all day. 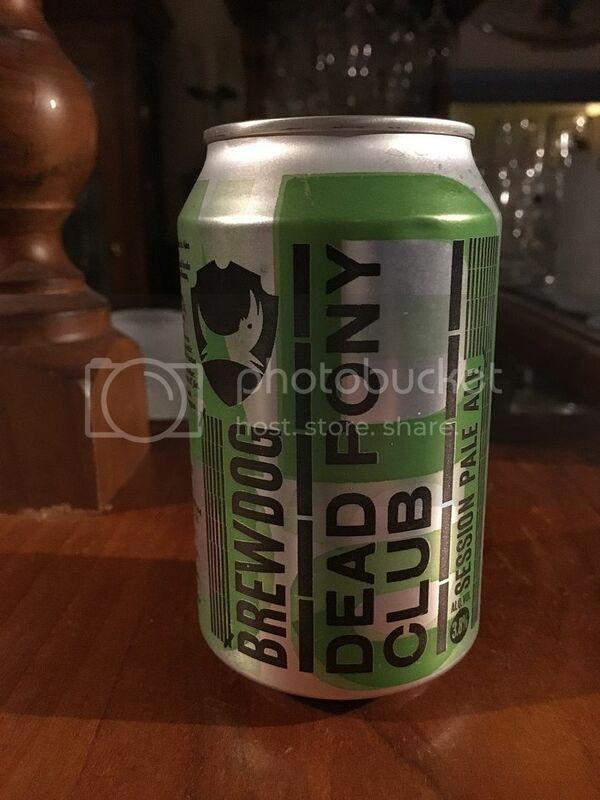 BrewDog Dead Pony Club - How could any low ABV Summer Beer/Pale Ale list be complete with one of BrewDog's offerings? Simply it couldn't be! Before this experiment I would have said Dead Pony Club if asked for my favourite sub-4% beer, hopefully it stood up to this billing. Read my full review, from October 2013, here. Thankfully it did! It tastes like a full strength American Pale Ale flavour-wise, with the beer certainly not lacking in hops. It's packed full of citrus and tropical fruit flavours in both aroma and flavour, with good, yet not overpowering, bitterness also imparted. The malt base is light but certainly important to the overall balance and body of the beer. 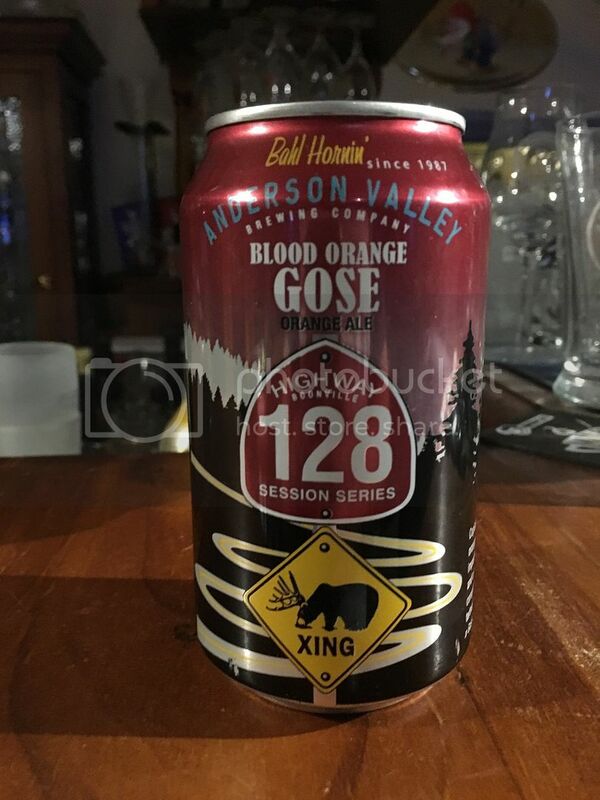 Anderson Valley Blood Orange Gose - Now this one is probably a little out of left field, however having tried it on a few people I think it has some merit. Gose is one of the most refreshing styles of beer available, if people can handle the sourness this beer will be a real summer winner! The Blood Orange Gose tastes exactly like what you'd expect it to. It's got a citrus, blood orange, flavour with a bit of saltiness. It's wonderfully refreshing and it's a style of beer that I really think could take off. The addition of Blood Orange in this one makes it's more palatable to the uninitiated, with sweetness from the citrus over powering some of the sourness. Most of these, with the exception of the Blood Orange Gose and the Pirate Life, are available from Dans. Result time, I think the best fit for the "Summer Beer" category comes down to 3 beers; Mountain Goat Summer Ale, Little Creature Dog Days & BrewDog's Dead Pony Club. All of these had lovely fruitiness, whilst not being too bitter. They also descend in ABV from 4.7%-4.4%-3.8%, something that could influence which one you pick. Bar the Matso's I don't think you could go wrong with any of the first 8 beers. Only pick the Gose if your mates are particularly adventurous!